Reader Joan Tait of Chertsey Lane, Egham Hythe wrote to me recently asking about the history of Truss’s Island on the Surrey bank of the Thames just above Penton Hook Lock. 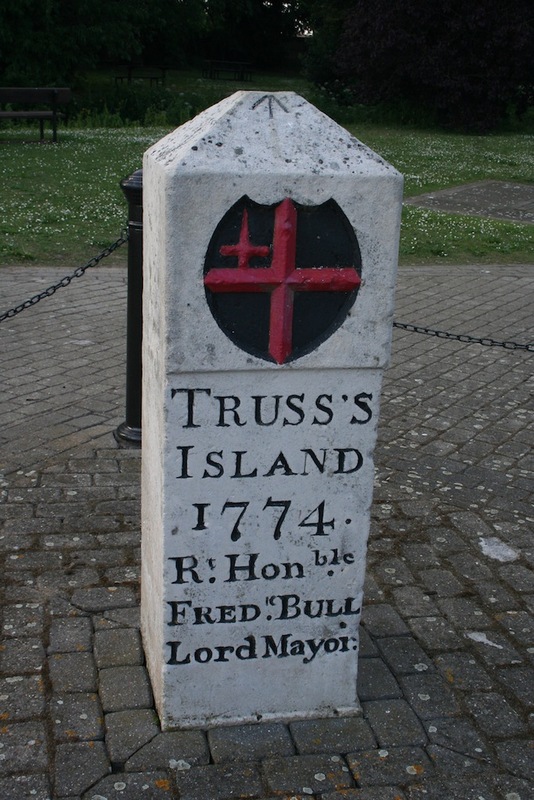 A stone on Truss’s Island recalls its history, dating back to when Charles Truss was Clerk of Works to the Worshipful Committee of Navigation in 1774. I did write about this little haven a couple of years back but it never hurts to revisit something in order to shed a little more light on it and to answer specific questions. Joan says: “I remember it had weekend wooden chalets some 40 or so years ago and I am vaguely aware that as their leases ran out they were not renewed so that the council could make a ‘Window on the Thames’. “When that was, I do not know. I particularly remember ‘Four Tops’ which was a collection of four small round buildings. The Island is named after Charles Truss who was appointed Clerk of Works to the Worshipful Committee of Navigation to the Corporation of the city of London in 1774 with the task of improving navigation on the river and who did excellent work in that regard. 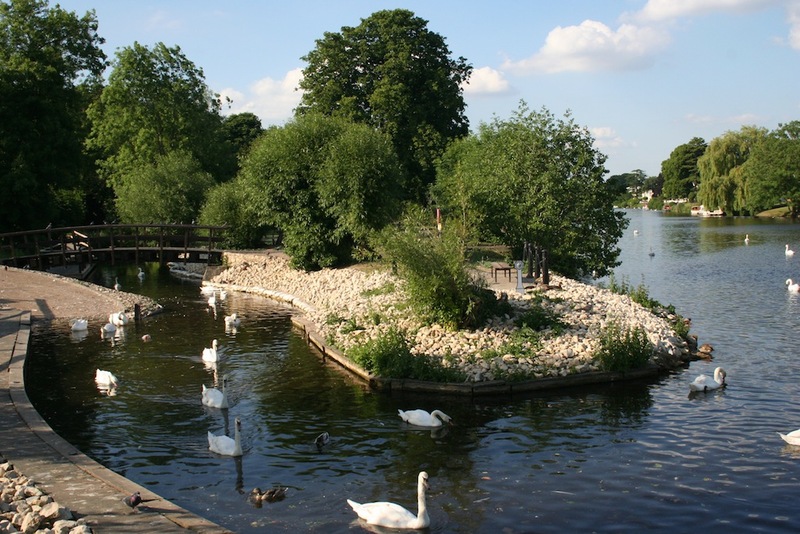 Joan, you’re absolutely correct about the weekend chalets being a feature along Chertsey Lane and it was in 1991 that Runnymede Council began the refurbishment of the island to create its Window on the Thames. And it certainly needed a makeover. The channel between the island and the bank had become completely silted up and the island itself was overgrown with shrubs and weeds. The council managed a mixed bag of renovations – the fishing platforms that were installed so that the disabled could enjoy angling as a past time were an excellent idea and the pathways leading to a pleasant picnic area were most welcome. But the notion of building a slipway so that small boats could be launched from the car park was a total disaster. Ever tried backing a trailer with a boat on it round a tight curve to get the boat into the water? And then compound the problem by building it where the channel bends sharply to join the main river? Personally, I’ve never seen a boat being launched from that slipway which seems to spend most of its time providing easy access to the car park for the dozens of swans and geese that inhabit the area. Does anyone else remember the Four Tops that Joan recalls? Let me know. FOR the first time in its history, Beaulieu boat jumble had to be cancelled on April 29 because of the gale force winds that were sweeping along the south coast. I know a lot of people were really upset that it was called off at such short notice – and I believe dozens of people had arrived from the continent intent on picking up a boating bargain or two. But spare a thought for the organisers who probably did the right thing by calling it off. If someone had been hurt by a stand blowing over or a boat being blown off its trailer there would have been hell to pay and they would have been taken to task for NOT cancelling it. Let’s hope they have better luck with the weather next year.